We wrote this on our Sarasota real estate blog a few weeks ago and thought it was good enough to post here. Since opening our doors nearly six years ago , we've worked with thousands of clients from all walks of life interested in calling the Gulf Coast their home. The Sarasota area notably draws a lot of attention with its stunning beaches and active lifestyle but more times than not our agents work with clients curious about the St Pete area and want to know the difference between the two cities separated by the Skyway Bridge. 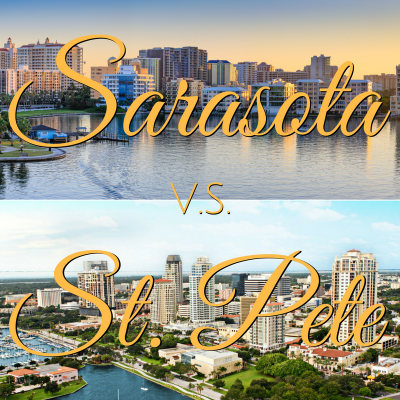 With the success of our older blog post, Sarasota vs. Naples, and now that our St. Pete office is up-and-running and buzzing with business, we felt it was as a good time as ever to compare these two Gulf Coast cities. Both Sarasota and Pinellas county cover a lot of terrain, and encompasses a number of cities and unincorporated communities, so to make this information easier to absorb, we'll gear our demographic information to the Sarasota and St. Pete city limits. Based on the 2016 estimates, the city of St. Pete nearly quintuples the city of Sarasota's population and offers over 4 times the city limit boundaries compared to Sarasota. If you're looking for a big city vibe, St.Pete might be the place for you, however, this data showcases full time residents, so prepare for a population increase in peak season. The percentage of persons under the age of 18 is higher in St. Pete while the percentage of persons 65 and older is higher in Sarasota. Is there a correlation between age demographics and post secondary schooling opportunities in the surrounding area (USF & UT), tough for us to say but definitely something to note. Median household incomes are relatively the same while median owner occupied housing values differ by $24,000; Sarasota holding the higher value at $169,100. 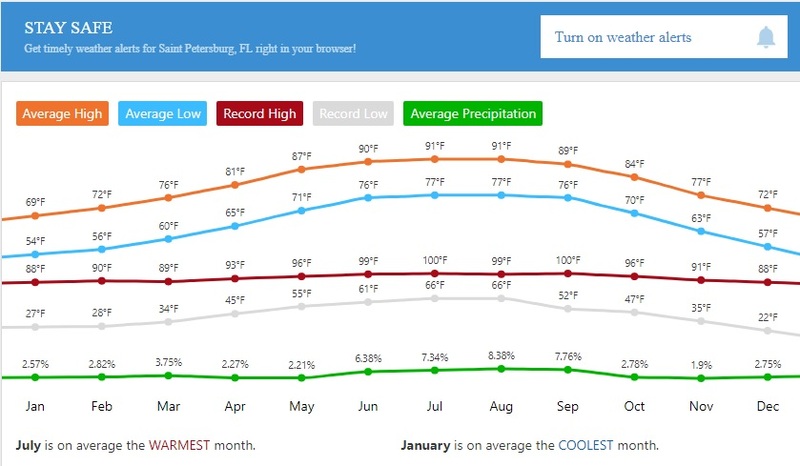 The charts below show weather averages for both Sarasota and St. Petersburg. As you might expect, they are going to be very similar since they are so close in terms of distance. 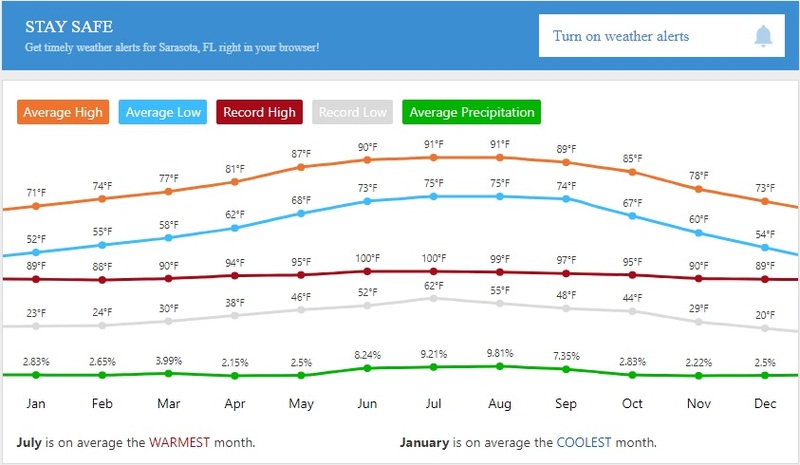 These charts are courtesy of Weather.com. The graphs below showcase how the real estate market in each County has faired over the last 15 months. As you can see from the charts below, Sarasota county real estate has a higher average asking price and selling price than Pinellas county real estate. Overall, real estate in St. Petersburg, FL is less expensive than Sarasota. Below is a chart representing the average price of all properties for sale and sold in Sarasota county. Below is a chart representing the average price of all properties for sale and sold in Pinellas county. Below we broke down the available inventory for sale showcasing how many properties are on the market in specific price frames. The luxury market for Single Family Homes and Condos in Sarasota County proves to be more plentiful than Pinellas. Keep in mind that St. Pete is a much larger market than Sarasota. That is why you see more single family homes and condos for sale between $500,000 and $1,000,000 in St. Petersburg. Both Sarasota and St. Pete offer a plethora of waterfront living opportunities whether you're looking for Bay, Intracoastal or Gulf frontage. Sarasota County's long stretch of barrier islands provides direct Gulf frontage facing west and direct Bay/ Intracoastal frontage facing east but the mainland also contributes to west facing Bay/ Intracoastal frontage as well as a number of channels and canals providing easy access to reach the Bay or Gulf. Pinellas County's unique peninsula shape offers a close 270 degree vantage to waterfront living. Similar to Sarasota, there will not be a shortage of waterfront living options. Beach, Gulf, Bay, Intracoastal and more. As you might expect from the real estate averages above, the price of waterfront homes and condos in St. Petersburg are less expensive than those found in Sarasota. Living on the water is a dream for many people looking to retire to Florida or own a winter residence. For many, Sarasota is too expensive to live on the water. As of this writing, the average waterfront property selling in Sarasota county is $630,000. If I excluded south county the average price would be much higher. For example, the average waterfront property on Longboat Key sold for just over $1,000,000 in June of 2017. Both downtown St. Petersburg and Sarasota area in high demand. Just take a drive around both cities and you will see the construction boom first hand. Construction cranes are working overtime in both downtown areas as the real estate construction boom continues into 2017. Living downtown is attractive to many. People want to be within walking distance to shopping, restaurants, bars, culture and other excitement. They prefer the walkable lifestyle instead of jumping in the car to access all of these things. With the current real estate boom as well as the last one we saw in 2003 to 2005 both downtown areas saw tremendous growth in construction of condos, retail and office space. There are plenty of fabulous places to call home. New condo buildings are always in high demand. People love the new design, trendy style, popular floor plans, fresh amenities and other things that draw people to new construction. Some of the new condo buildings in downtown Sarasota include 7 One One Palm, 1500 State Street, One88, Orange Club, Sansara, The Mark, The Q, and The Vue. Some of the new condo buildings in downtown St. Petersburg include One St. Petersburg, Bliss, 747 North, and The Salvador. When it comes to the powder white sand found along the Gulf coast, your options will likely be similar in both Sarasota and Pinellas. Both government county sites proclaim having 35 miles of beach frontage. Sarasota County appears to offer more public access locations for people to enjoy some fun in the sun. Pinellas County has a handful of public access points but also requires a parking permit in their lots ($5 a day or $75 for an annual parking pass); something, currently, not done in Sarasota County. There is never a dull day for entertainment in either county. Both offer a huge collection of performing arts, museums, music venues and cultural events. St. Pete's Ruth Eckerd Hall will likely show more noteworthy national touring shows but Sarasota's Van Wezel Performing Arts gives Ruth Eckerd a run for their money with seasons of great shows and performances. St. Pete's slight edge to Sarasota would be it's proximity to major sporting events and headlining tours. St. Pete is home to the Tampa Bay Rays Baseball team and is only a short distance away from major venues that host concerts, touring shows and act as the home base for the Tampa Bay Lightening Hockey Team and Tampa Bay Buccaneer football team. St. Petersburg is a larger city so naturally, it will have more crime. According to the statistics below there is more crime per capita. I am a bit leery of statistics like these. All of the crime reporting websites claim that Bradenton, FL (town just to the north) has less crime and is safer than Sarasota. Honestly, I am not sure how that is possible. Education quality is big factor when deciding where to live. It drives real estate desirability because few parents want their kids to get a bad education. So how do the schools compare between Sarasota and St. Pete? There are a lot of good resources on the web for researching schools. I have used Greatschools.org to learn more about individual schools. According to Niche.com they rank Sarasota county schools #4 in the state and rank Pinellas county schools #19 in the state. I cannot vouch for that website so please do your own research. According to Niche.com, The 2017 Best School Districts ranking is based on rigorous analysis of key statistics and millions of reviews from students and parents using data from the U.S. Department of Education. Ranking factors include state test scores, college readiness, graduation rates, SAT/ACT scores, teacher quality, public school district ratings, and more. In many aspects, both of these areas are pretty similar and would really boil down to personal preference and lifestyle options. Pinellas County, St. Pete specifically, offers a big city setting with a larger, younger population with relatively more affordable housing options. Sarasota, downtown specifically, is smaller but offers a growing metropolitan setting with an emphasis on the luxury real estate market. We encourage visitors and buyers to scope out both areas and get a sense of which area best fits the Florida lifestyle you have in mind. Regardless of where you choose, there will be plenty of recreational and cultural activities to participate in and DWELL Real Estate can easily facilitate any sale in either county.